No-touch aikido, yes it’s real! This month Sensei is focusing on the kokyu (breath power) techniques of aikido. These are techniques that, at the highest levels, do not require physical contact with your training partner (or assailant). Kokyunage, one of the six pillars of aikido, is one of the more famous categories of aikido techniques and comes under intense scrutiny, particularly from other martial arts. At the basic level, all kokyu techniques begin with a physical connection to your partner. This is to ensure there is rigour in the technique and that it absolutely can and does work. Because aikido is a movement art, under the dynamics of practice the physical contact becomes progressively lighter as it is practised at higher levels. Aikido operates by taking our training partner’s balance (or centre) right from the start of the technique, so our partner is in a perpetual state of unbalance through the movement until they decide to lie down or are thrown. 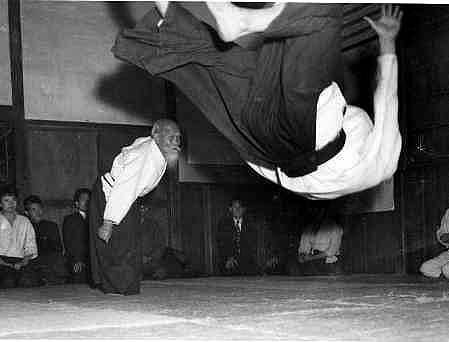 In aikido we are always practising both a technique and, as uke, a movement-based defence to that technique (this is an essential survival skill, as well as ensuring that we don’t run out of training partners in the dojo). Thus uke, the person receiving the technique, learns to mitigate the martial aspects of the movement by riding the power of the throw. In our dojo we practise multiple levels of each technique beginning from static (where we develop our alignment and understanding of forces). We then practise under movement where we learn to coordinate ourselves dynamically and keep that alignment. At the higher levels of practice the physical and mental connection with our partner shapes the movement giving rise to ‘no touch’ technique. This ensures that our kokyu or ‘no touch’ techniques work, steering a path between collision and collusion to provide a direct physical experience of ‘aiki’. We avoid collision so as not to muscle through the technique with brute strength, and also avoid collusion so that training does not become a ritualised dance. Over the course of the next month Sensei will be building on our foundation levels of practice to further develop our kokyu techniques, together with improving our ukemi to better receive them as uke. We look forward to seeing you there. Below: Sensei practising with a direct student of the founder in Japan, stepping through the various levels of practice.